Melt butter in a saucepan over low heat. Add the brown sugar and stir to combine. Turn up the heat just a bit and stir until mixture is hot and starting to bubble. Remove from heat and transfer mixture to a mixing bowl. Let cool until you can comfortably test it with your finger. Add vanilla, baking powder, salt and spices. Beat well. Add egg, beating until smooth and scraping the sides and bottom of the bowl. 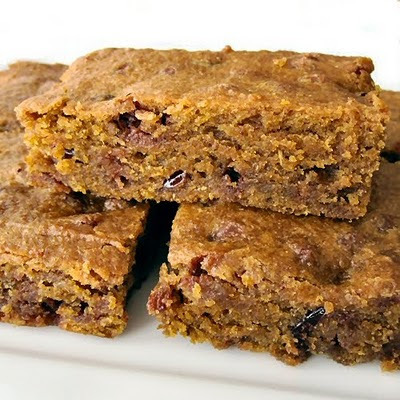 Stir in the pumpkin, flour, raisins and dried cranberries, mixing thoroughly. Spoon batter into prepared pan. Bake the bars for 40-45 minutes, or until a toothpick inserted in center reveals moist crumbs. Remove from oven and let cool on cooling rack.